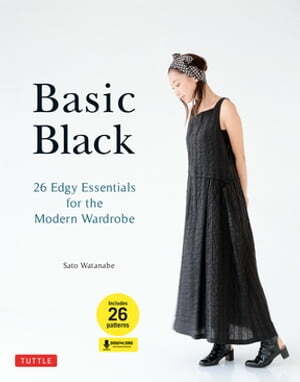 Collins Booksellers - Basic Black by Sato Watanabe, 9781462915620. Buy this book online. Basic Black is the English edition of a classic Japanese sewing book which provides sew-it-yourself Western-sized patterns for 26 basic garments, along with detailed, easy-to-follow diagrams and instructions. Author Sato Watanabe has published many books that are favorites among Japanese sewing fans. In this book, she shows you how to make truly professional-quality pieces easily and inexpensively at home. All of the styles and fashion are easily customized to create your own personal style, and there is truly something for everyone and every occasion in this book—from a smart two-texture combo dress to a relaxed, bohemian tunic—and everything in-between. All the styles are thoroughly modern and practical, ranging from softly feminine or straight-line simple to smartly-tailored or loosely-deconstructed.